A federal judge has halted Pier 55 in New York City’s Hudson River Park, a constructed island of 2.75 acres expected to cost $200 million. 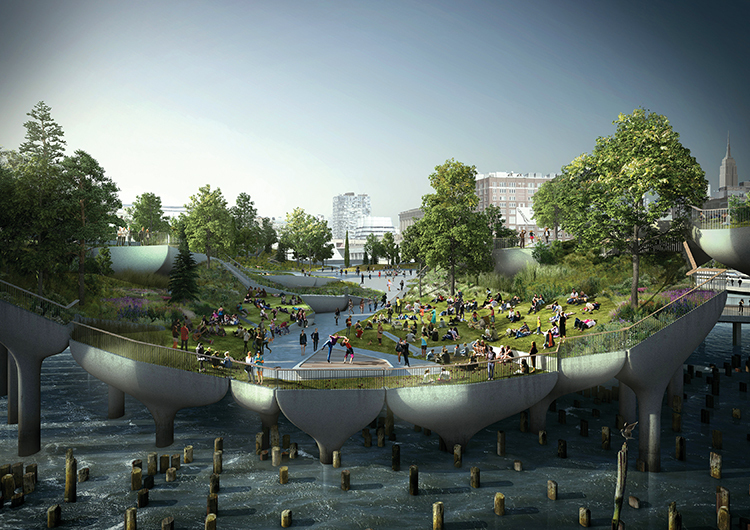 Plans for Pier 55, by the British design sensation Thomas Heatherwick and Mathews Nielsen Landscape Architects, call for a sloping, verdant extravaganza atop hundreds of mushroom-shaped concrete pilings driven into the riverbed. The new parkland was designed to do double duty as performance space and would be largely paid for by the billionaire Barry Diller and his wife, the fashion designer Diane von Furstenberg, who had established a nonprofit to maintain the place and establish programming for the venues. In 2013, LAM filmed a wide-ranging and very candid conversation between Signe Nielsen, FASLA, and Michael Van Valkenburgh, FASLA, two longtime friends, on New York, urbanism, and landscape architecture practice. With more than 60 years’ design experience between them, Nielsen and Van Valkenburgh talk about the range of Nielsen’s projects, including Hudson River Park and the South Bronx; lessons from Hurricane Sandy; how to (and how not to) work with developers; the problem of “sustainability” as a trend; Nielsen’s first meeting with Kim Mathews, ASLA, her partner of 20 years at Mathews Nielsen Landscape Architects; and learning to take the lead on big urban projects. For more on Nielsen and the work of Mathews Nielsen Landscape Architects, pick up a copy of the April issue of Landscape Architecture Magazine. The digital issue is free or you can buy the print issue at more than 200 bookstores, including many university stores and independents, as well as at Barnes & Noble. 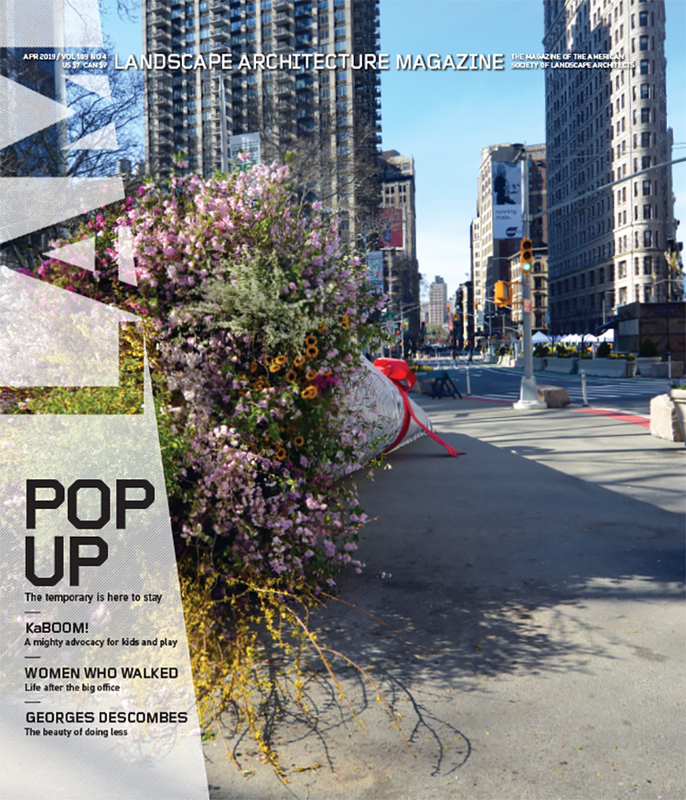 Single digital issues are only $5.25 at Zinio or order single copies of the print issue from ASLA. Annual subscriptions for LAM are a thrifty $59 for print and $44.25 for digital. Our subscription page has more information on subscription options. February’s issue of LAM minces no words, starting with Fred A. Bernstein, who talks with female landscape architects whose firms listed as women business enterprises, or WBE’s, can sometimes attract jobs that make them feel as if they’re on board only to fill a quota; Jerry van Eyck, ASLA, a Dutch landscape architect who transplanted himself to New York, is making his mark in North America with !melk, his firm of four years that has public space and park business projects as lively as his character; and the Pérez Art Museum Miami’s grand new building by Herzog & de Meuron and ethereal hanging gardens by Patrick Blanc become backdrops to the small yet thoughtful designs of ArquitectonicaGEO, which repurpose the neglected Miami waterfront with native plantings and innovative flood control. In Now, Camden, New Jersey, proves that park renovations don’t always have to be expensive. In Water, Anne Raver follows up our earlier coverage of Owens Lake in California, where an official decision has now been reached on how to tamp down the toxic dust blowing off the dried lake bed. Planning takes a look at the wave of the future in ecodistricts; House Call visits a picturesque vineyard by Scott Lewis Landscape Architecture, which won a 2014 ASLA Honor Award in Residential Design; and in The Back, the long forgotten Älvsjö Flatbed, produced by James Corner a generation ago, reveals a design language ahead of its time. All this plus our regular Species, Goods, and Books columns. The full table of contents for February can be found here. Credits: “A Hand Up, A Hand Down,” Greeen/Shutterstock.com; “!melk Man, Jerry van Eyck,” Patrick Pantano; “Soft Landing,” Robin Hill/Courtesy ArquitectonicaGEO; “For A Song,” Sikora Wells Appel and Group Melvin Design; “The Dust Settlement,” Nuvis Landscape Architecture and Planning; “What Ecodistricts Need,” GBD Architects; “Among the Vines,” Matthew Millman Photography; “Everything on the Table,” Pierre Bélanger, ASLA. Some argue the funding for the Hudson River Park could be put to better use elsewhere in the city. Barry Diller is a billionaire who has committed to underwriting the lion’s share of a $130 million plan for the construction of Pier 55, a 2.7-acre island of undulating parkland and performance venues that would rest atop mushroom-shaped pilings in New York City’s Hudson River Park. The city’s power brokers have enthusiastically endorsed the proposal, which also includes a 20-year lease under which Pier55, Inc., a nonprofit Diller founded with his wife, the designer Diane von Furstenberg, would pay for the pier’s upkeep and oversee its programming. And quite possibly, the Pier 55 project would help bail out the chronically cash-strapped Hudson River Park Trust, the quasi-public entity charged with running Hudson River Park and raising funds for its maintenance. However, at a community meeting last week in Manhattan’s West Village neighborhood, which abuts Hudson River Park, many residents had a host of concerns about the Pier 55 project. They questioned its futuristic aesthetic, its environmental impacts, and its contribution to the larger public realm. They also questioned whether their input would be considered during the design process and what trade-offs the Hudson River Park Trust was making in exchange for accepting what reportedly is the single largest private donation to a public park in the city’s history.